ALTO: SI HABLAS ESPAÑOL Y QUIERES LEER ESTO, HAZ CLICK AQUÍ. Hiiiii~ How are you guys? Are you ready for this December? I hope you are. In my last post, way back like 2 months ago (I’m so irresponsible) I promised I’d write a post about how I organize my time being a freelancer. I’ll tell you how I went from a mess of a freelancer to an organized and responsible freelancer thanks to Bullet Journals. First things first, What’s a Bullet Journal? I’ll leave you a video explaining the original method and also Fran’s video. But basically it’s an analog system which helps you organize your tasks in any notebook you have at hand. Why not just use an appointment book? Design: I know, basics. I seldom like the design on premade appointment books and I’m not a fan of how they all have the dates already marked, with a fixed number of pages and limited spaces. That means that if I want to start my journal on April I’d be losing 20% of the book because the pages before that would be basically useless. In short: I’m fussy. Customization: Bullet Journals have something I love and it’s that you can make one out of any notebook you want and you can customize it in any way you like; you can make a full journal or divide it into half journal, half notes. Flexibility: It has a working system which is also flexible enough for you to add or remove things as you see fit. It’s not strict at all and you don’t have to apply the entire system. • When we think of projects, we think of them as a whole thing, a complete unit that must be completed in one go instead of something you can make step by step, divided in smaller parts. • This is what you must do with your goals. Go from macro to micro, from the big goals like “Making a children’s book” to “Drawing to pages a day”. The thing is to break them down in smaller goals you can fulfill each day until a given deadline or until it’s done. Don’t rush to break them down into a 4-steps-task, think well about how you’re going to divide it, what are the specific steps you must take to achieve it calmly and clearly. For example, think of Inktober as a commision. It’s a very simple idea that helps you a lot. Even when you make a budget it’s a good idea to send the client the whole process you’ll be making. It helps the clients understand how you work and to become more confident. • Make realistic goals. Let’s say you do what I’m saying and you divide your projects like this but then you rush and make 30 smaller tasks for one project and assign yourself 10 daily task. Exactly, it won’t work. Stop trying to do the impossible. Make realistic goals. • Having realistic goals and dates will be related to your working pace and how much time you invest in each thing. At first it’s hard to know how much time each thing takes, but don’t worry about it, you’ll figure it out bit by bit, but meanwhile, when you think of a deadline try adding one or two days (or weeks) to it and try to deliver before the actual deadline. • When I organize my project goals I try to make them into the extend of time I’d like to have them done. Like a 3 months project or 3 weeks. You can do it as you prefer, but the important thing is to set deadlines, otherwise the goals will just be floating around without getting them done. • When you make your plans, divide them in personal and work plans. It’ll help you keep track of how you program and organize each one. Now, How do I translate all this into my Bullet Journal? • I chose a really cute notebook which inspires me and motivates me to stay organized. I use a Moleskine notebook because of their durability and I love their colors. • For me, having a Bullet Journal is not just about being organized but also about staying motivated. That’s why I have a page with 3 post-it notes with phrases that inspire me and remind me I should keep going. I also like to write each month by hand in a sort of “lettering” so it look cuter and to practice my handwriting. • When you make a task you’ll have a checkbox next to it, which you’ll check when said task is completed. But what if you don’t complete it? I suggest you make a symbol index so you know which symbols means what among the different results for tasks and events. • Make a list of all your goals for the year or the upcoming months. It can be as long as you want it to, but get all your goals in there. Then you can choose which one you’ll keep according to time, complexity o just the ones you’re excited about. As you can see in the next picture, I ended up with 2 lists. The first one about personal and work projects, and the second one about 3 golden goals (plus another 3). What I’m aiming for by having these written in my notebook, is to have a clear idea of where I’m going with all this organization. Having this in mind helps a lot when going over them and being organized to achieve them. Some of them I failed to achieve, but I’m proud I got to accomplish others. I also organize everything with a handmade calendar so I can quickly check my medical appointments, payment dates, my friends birthdays, etc. • Break down your goals for the month into daily objectives and organize them throughout the 4 weeks of the month. Remember to do it evenly so you have enough time to accomplish them all. Be committed and responsible. So you can organize your goals into the Bullet Journal, I present you 2 templates I use for the week. You don’t have to follow them to the letter, you can do it as you think best. And even though I have my bullet journal, I also make use of a whiteboard marked with the days of the week, where I keep track of all my weekly tasks so I can check them easily each day. And that’s it. 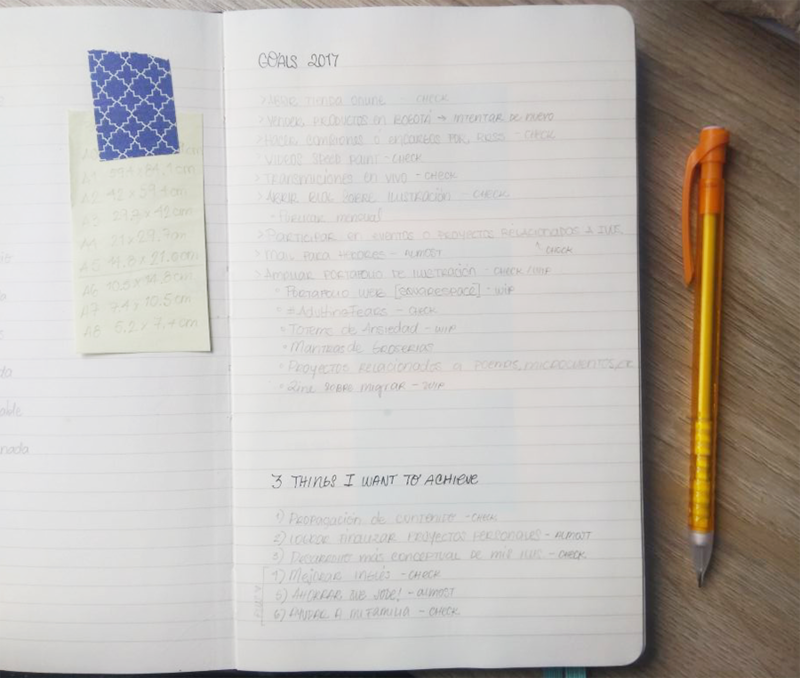 Having a Bullet Journal has worked a lot for me, I love it and each day I discover a new way to make it more organized and motivate me even more. A lot of creative people think that being so orderly and methodical kills creativity, but I think it actually feeds it since this way you keep a clear sight of your objectives. Keep in mind, this doesn’t necessarily have to work for you. I gave it a try because I was not doing quite so well keeping a digital schedule. I think my memory works better when I write things down. If it’s not for you just try some other thing or stick to whatever method you like best. • Harvest or TrackingTime: they’re plug-ins for Asana where you can keep track of how much time each assigned task takes. It’s great to measure the time each one takes so you can then make a budget and schedule times. • Pomodoro (Brain Focus App): Some have heard about this one for productivity. They’re time slots where you have to stay completely focused on a given task for 25 minutes with 5 minutes breaks after each slot. After a couple of full cycles you can take a 15 or 20 minutes break to rest. It’s great to make yourself stay focused and finish tasks faster. That’s all folks. That’s my personal method to stay organized and manage some things with my clients. I hope you liked this post, I feel like it was too long, but I tried to make it as brief as possible. If you have any questions, leave them in the comments and I’ll be happy to answer them. As a gift, I’ll leave you a really cute template you can print and use for any month or week of the year. Download it here. • If you want to receive updates about the blog or my work promotions, this is the place you must subscribe to.